Located in the heart of Bruges, the Montanus hotel**** is anideal, quiet downtown place to stay, close to all major attractions. This elegant hotel is situated amidst a beautiful urban park. Both the cottage-style garden pavilion and the grand mansion provide romantic guest rooms and suites. The Garden rooms offer a nice view over the garden and the pond. On sunny days, the terrace is the perfect place to relax over a drink. The hotel offers 24 non-smoking rooms, all tastefully decorated and featuring a modern and luxurious comfort. 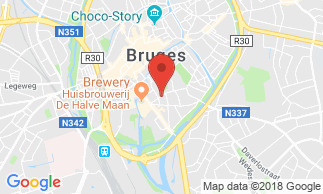 The hotel is located in the heart of Bruges, 100 metres from the park of Minnewater, within walking distance of all tourist and historical attractions: the Beguinage (old Convent), the Halles, the Hall Tower (Belfry), the Market Place...and a few minutes from the congress centre Old St. John . Buffet breakfast not included in the room rate: 18 EUR per person.